LIC of India has completely redesigned and revamped its popular eServices portal for customers and launches ‘Premier Services‘ to offer streamlined services. One major change with redesigned eServices is that Aadhaar or PAN number has been made mandatory to access the portal. The newly designed portal offers easy navigation with better user experience. Let us have a look at the major changes and the functionalities of the new e services portal which includes newly launched Premier services also. How to login to LIC eServices portal? LIC eServices portal is available at LIC of India’s website (www.licindia.in) and can be accessed using the link ‘Customer Portal’ provided prominently in the home page. On clicking the link you will be taken to a new page where you can select the options ‘New User’ or ‘Registered User’. Select the option applicable for you. New Users – How to register for eServices ? In order to enable ease completion of registration process for eServices, it is advisable to keep following information handy. Enter the information as shown in the info gram shown above. All the fields marked with * are to be filled promptly. Either one of PAN or Aadhaar number is mandatory for new registration. Instalment premium does not include the service tax or GST if any, paid along with the premium. Click on ‘Proceed’ button once all the fields are filled. Select ‘username’ and ‘password’ of your choice and complete the registration process in the next screen. View this video tutorial to understand more about LIC’s eServices and premier services. Customers who have already registered for eServices earlier can login to new eServices portal using their existing username and password. But the login interface has changed which requires you to give your date of birth also along with the user name and password. When you login for the first time to the portal you will be prompted to give your Aadhaar or PAN number to proceed. Aadhaar or PAN number provided once is automatically stored in your profile and you need not enter it again in future logins. LIC Premier Services – What is it ? In the new eServices portal, LIC of India offers two levels of services. Basic services are available for all policy holders who register for eServices while Premier Services are available only to policy holders who undergoes premier services enrolment procedure. As eServices can be availed for the policies of self, spouse and minor children, Premier services can be availed only for policies of self and minor children. Update: LIC has started Online Loan Processing and Repayment through e Services Portal. Read more on how to take and repay ONLINE loan from LIC. 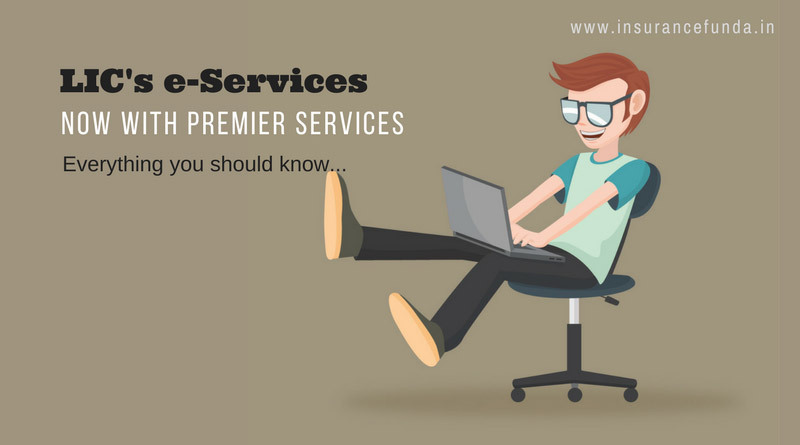 LIC Premier Services – How to register? After verification by LIC, an acknowledgement e-mail and SMS will be sent to you. Now you are ready to avail the Premier Services. uploading of the documents are to be done through the “upload and submit documents” option available. Note# The file size of the scanned image should be less than 100 KB and the image has to be in any of the following formats: .bmp, .png, .jpg, .jpeg, .gif, .tiff. Please don’t crop out any part of the image and avoid blurred image. How to Apply and Repay ‘Online’ Loan from LIC policies.